Myths | Was Mom Wrong? True or False: Grapefruit juice can impact many medications? 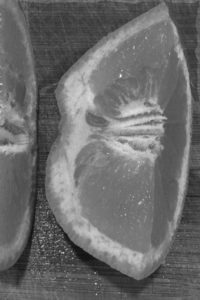 I WASN’T MUCH of a grapefruit fan growing up—that is, unless my mother cut the grapefruit in half, separated the pulpy and meaty portion of the fruit from the tough—and sometimes bitter—skin surrounding it, and covered the entire surface with sugar. I find it interesting that my kids are the same way—and they weren’t even around when I was growing up! As an adult I now enjoy peeling a grapefruit and eating it slice-by-slice, the way most people eat oranges. Grapefruit is healthy; it’s low in calories, it contains lots of vitamins and minerals, it’s a good source of fiber, and it contains antioxidants. Most of us can consider grapefruit a “safe” fruit. However, it is true that grapefruit or its juice can have a negative impact on many medications. You should exercise caution if you take medication and you want to eat grapefruit or drink grapefruit juice. Grapefruit juice doesn’t interact directly with medications; it inhibits an enzyme in your small intestine that works to break down certain medica- tions. Interfering with that enzyme can result in too much medication enter- ing your blood, potentially leading to a dangerous situation. This phenomenon was accidentally discovered in the late 1980s. Researchers investigating the interaction of alcohol and the prescription drug felodipine used grapefruit juice to cover up the taste of the alcohol. However, one result of the study was a large increase of felodipine in the blood of research participants. Grapefruit juice can also have the opposite effect, lowering the concentra- tion of a few medications in the blood. There are dozens of medications that can be negatively affected by grape- fruit juice, including those for pain control, hypertension, allergies, high cholesterol, depression, epilepsy, heart disease and asthma. Other citrus fruits that may interact with medications include Seville oranges and tangelos. Lemons, limes and regular oranges generally are thought to have a low risk of interacting with medications. If you take prescription or over-the-counter medications, have a conversation with your doctor or pharmacist if you wish to eat grapefruit or drink grapefruit juice. Kiani, J., & Imam, S.: Medicinal importance of grapefruit juice and its interaction with various drugs. Nutrition Journal (2007), Vol 6, pp. 33-41. True or False: Honey is an effective cough suppressant? HOME REMEDIES FOR the common cold and other minor ailments often have great appeal because of reduced cost and decreased risk of side effects, which might not be the case with prescription medications. For decades, parents turned to over-the-counter cough medicines containing drugs such as dextromethorphan or diphenhydramine to relieve their children’s nagging coughs. As parents of three, my wife and I have spent a fair number of near-sleepless nights consoling our restless children when they were suffering from hacking coughs. I remember making more than one trip to the grocery or drug store late into the evening hours to fetch cough medicines we thought would help. That ceased in 2007, when the Food and Drug Administration questioned both the effectiveness and safety of these cough suppressants for young chil- dren. That’s when we started looking for a more natural remedy for our kids’ persistent coughing, and that’s when we first tried honey. As we talked to more parents, we learned that many of them used honey to help control coughing in sick children. We discovered that honey really does work, and it has been verified in a number of published studies. One high-quality—in other words, randomized, double-blind and placebo-controlled—research investigation conducted by Cohen and colleagues (2012) and reported in the journal Pediatrics examined the effect of honey on nocturnal cough and sleep quality. 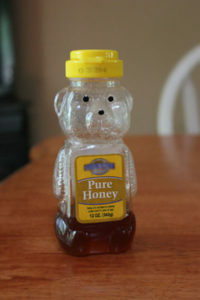 Caution: You should avoid giving honey to children under 1 year of age, as there is a risk of botulism. Honey could help control coughing by coating the back of the throat, thus reducing irritation from persistent coughing. And honey has antioxidant as well as antimicrobial properties that might be beneficial. The sweet flavor of the honey could result in a child’s body creating more saliva, thus reducing the thickness of throat mucus. One other caution: Some children are allergic to honey, as we learned when we gave our middle child his first-ever teaspoon of honey late one evening for his cough. His body’s reaction resulted in a trip to urgent care. We usually try to control a cough only if it is persistent or is disrupting sleep. All coughing isn’t necessarily bad; it is one way your body works to clear mucus from your throat. If you’ve never thought about using honey to help control coughing, I’d recommend giving it a try. It has really worked for our family. And if you’re feeling especially brave, mix it with a teaspoon of vinegar. Cohen, H., Rozen, J., Kristal, H., Laks, Y., Berkovitch, M., Uziel, Y., Kozer, E., Pomeranz, A., & Efrat, H.: Effect of honey on nocturnal cough and sleep quality: a double blind, randomized, placebo-controlled study. Pediatrics (2012), Vol 130, pp. 465-471. True or False- Jell-O is good for your knees because it has ground up cartilage in it? We established in chapter 15 that gelatin is made by boiling the bones, skins and hides of cows and pigs. When I sent that chapter to my editor, she said it reminded her of a tape she listened to years ago that described how eating cartilage from chicken bones was helpful in preventing arthritis. She also said she consumes two envelopes of unflavored gelatin every morning to help stave off arthritis. Let’s explore if that is really effective. Whether you talk to highly competitive athletes or to individuals in their 60s, 70s or 80s, joint pain is a common complaint. I spoke to a group of retired educators shortly before I wrote this chapter, and following the presentation, I had a long discussion with a woman who said she doesn’t exercise at all because of pain in her knees. As someone who has been working in the areas of health and fitness for the past 20 years or so, I can confidently say that I’ve heard this complaint hundreds of times. When the cartilage that covers our bones (called hyaline or articular cartilage) incurs damage, we experience inflammation, pain and decreased range of motion. Because this affects millions upon millions of people, it makes sense that we might look for simple and inexpensive remedies such as taking gelatin. From the reading I’ve done, it appears that gelatin is good for strengthening hair and fingernails and for protecting our joints. This might be a legitimate claim, because gelatin contains the amino acids proline and glycine, which are thought to be particularly important for healthy cartilage. As I began conducting research for this chapter, it became obvious that there is very little published research on the topic. I did find a report of a study conducted at Ball State University indicating that a gelatin supplement improved joint pain in athletes. Unfortunately, the study was never published in a peer-reviewed scientific journal, nor were the details or specifics of the study released. Plus this particular study was funded by the company that created the supplement, raising even more questions about its validity. “Is of interest” certainly doesn’t equal good scientific evidence, in my opinion. In addition, the studies conducted with gelatin supplements and pharmaceutical gelatin are using different and more-concentrated forms of gelatin then you would find in, for example, commercial Jell-O. I will continue to enjoy Jell-O on occasion; however, I don’t believe it will improve the health of my knees, which have been subjected to a number years of self-inflicted abuse from wrestling, track and football. Reference: Moskowitch, R. Role of Collagen Hydrolysate in Bone and Joint Disease. Seminars in Arthritis and Rheumatism (2000), Vol 30, pp. 87-99. 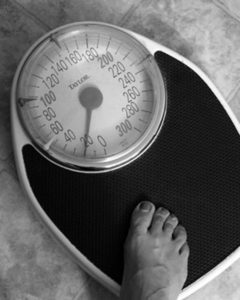 True or False- Freshman in college gain on average 15 pounds? We often hear “The Freshman 15” to express the amount of weight supposedly gained by students in their first year of college. I’ve had the privilege of teaching health-related courses on college campuses in New York, Colorado and Wisconsin, so I’ve often dealt with this topic in classes and in my speaking engagements. It is indeed true that most college students gain weight during their first year; however, it is not nearly 15 pounds. We’ll talk more about the actual number in just a bit. First, I would like to explore factors that contribute to weight gain in college freshmen. One is alcohol consumption. A single drink can contain from 100–150 calories, so a student who consumes eight or 10 drinks in a night out with friends could be adding 800–1,500 calories that day. And students who have been drinking are often more likely to make a late-night food run; Taco Bell is one favorite. Those extra calories add up! 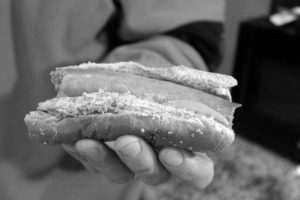 Some students get into trouble with the buffet/cafeteria-style all-you-can- eat dining services available on most college campuses. They return for two or three entrees, a variety of not-so-healthy side dishes and multiple high-calorie desserts. Who wouldn’t be tempted to end each meal with a huge soft-serve vanilla ice cream cone! Again, the new lifestyle offers lots of extra calories. Many college students are less active than they were in high school. When I pose the question of how many students were involved in two or three sports in high school, routinely 80–90% of them raise their hands. A very small percentage of those same students compete in college athletics. They no longer engage in daily two-hour practices as they did in high school, so less physical activity means burning fewer calories. Plus college can be hectic; many students hold part-time jobs and find that college-level classes require more study time. Both scenarios can negatively affect their levels of physical activity. I think it’s interesting to note that young adults 18–19 years old who don’t go to college gain about the same amount of weight as those who do attend college. So perhaps a general lifestyle change, rather than entering college, is responsible for weight gain in this young-adult population. Vella-Zarb, R., and Elgar, F. The ‘Freshman 5’: A meta-analysis of weight gain in the freshman year of college. Journal of American College Health (2009), Vol 58, pp. 161-166. True or False: You burn more calories when you drink ice-cold water? Roughly 75%–80% of Americans are overweight or obese. It certainly is understandable that people would look for a variety of ways to burn extra calories and lose weight. It is true that you burn more calories when you drink ice-cold water. The reason? Your body has to expend some energy (calories) raising the temperature of that water to bring it to the temperature of your body. However—and I’m really sorry that there is almost always a “however”—the number of additional calories we burn when we drink ice-cold water is very small and likely would not affect weight-loss efforts. Think about it: If losing weight were as simple as consistently drinking ice-cold water throughout the day, we might actually be able to put a dent in today’s obesity rates. Our bodies are composed of between 60% and 70% water. Were you aware that your brain is 90% water, your blood is 83% water, your muscle is 75% water, and your bones are 22% water? 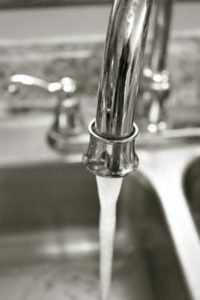 Water is vital for health and necessary for most of our bodily functions. Water is important for creating saliva, protecting our organs, transporting and dissolving nutrients, regulating body temperature, lubricating our joints, circulating our blood, keeping our skin healthy, digesting and absorbing our food, and helping us fight illness. There is some credibility to the idea that drinking water before (or with) meals and replacing sugary drinks with water can significantly reduce your caloric consumption and aid in weight-loss efforts. But again, drinking lots of ice-cold water won’t result in burning a significant number of calories. 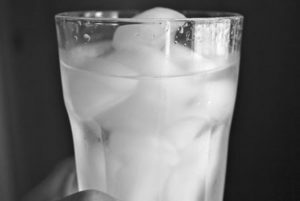 One final word of caution: Drinking ice-cold water can increase abdominal symptoms like diarrhea and cramping in some individuals with conditions such as irritable bowel syndrome. Brown, C., Dulloo, A., and Montani, J. Water-induced thermogenesis reconsidered: The effects of osmolality and water temperature on energy expenditure after drinking. The Journal of Endocrinology & Metabolism (2006), Vol 91, pp. 3598-3602. True or False: Gelatin is made by boiling the bones, skins, and hides of cows and pigs? Gelatin simply is processed protein. It is similar to the structural protein collagen, a tough, fibrous protein found in connective tissue such as ligaments and tendons as well as in skin, bone and cartilage in humans and many animals. Collagen gives these structures strength and in some cases, elasticity, helping them stretch without tearing or ripping. “Congealing” means to make thick or solidify, which is what happens when you make JELL-O. Most of us, either when we were children or as adults with our own children, have made JELL-O. The process is quite simple: Mix the JELL-O powder in a bowl with a cup of boiling water, add a cup of cold water, stir, and place in the fridge and wait. The waiting is the hard part for kids! JELL-O JIGGLERS® (you use only one cup of water and cut the chilled, firm JELL-O into shapes) are a huge hit with our three kids. Making JELL-O or other gelatin brands is the most common use of gelatin. JELL-O was patented in 1845 by Peter Cooper, and I read recently that Kraft Foods sells over a million boxes of JELL-O a day! There is even a museum in Le Roy, N.Y., dedicated to JELL-O. The first four JELL-O flavors were orange, lemon, strawberry and raspberry. There have been 36 flavors of JELL-O sold over the years; some of the flavors that didn’t last include apple, chocolate and coffee. Gelatin is also used in cosmetics, shampoos, candy, photographic film and the coating on vitamins. The process by which gelatin is made (boiling animal parts) may sound a bit disgusting to some, and it may on the surface appear to be unclean and not very safe. However, the steps are strictly regulated. The heating, treating and filtering process makes gelatin safe for consumption. As you can imagine, many vegans avoid gelatin products because it originates from animal parts. If this is a concern for you and you’d like to be able to eat gelatin, there is a vegan version called agar that is derived from seaweed. 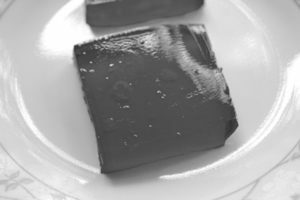 Agar is also a good setting agent—we talked about gelatin’s congealing characteristic earlier in this chapter—and is commonly used throughout Asia in desserts. And some gelatin producers are starting to use more fish products to make gelatin. I have to admit that prior to researching and writing this chapter, I had heard that gelatin was made from boiling the bones, skins and hides of animals, but I wasn’t certain it was true. Now that I know it is, I will think a bit differently about products with gelatin in them—but likely will still enjoy an occasional JELL-O JIGGLERS® with my kids. Gelatin. Columbia Electronic Encyclopedia, 6th Edition; 11/1/2011, pp. 1. Columbia University Press. True or False: Exercise after eating a meal causes food to be digested faster and fewer calories to be absorbed? If you do a quick Internet search on this topic, it won’t take long to find recommendations to go for a walk after eating a meal. The rationale? The movement associated with walking will speed digestion and maybe even result in absorbing fewer calories. One interesting statement I found on a website that advocates walking after eating suggests, “Getting a jump on digestion [by walking after a meal] will help continue that process through the night, burning more calories and shedding pounds faster.” This simply isn’t true. Walking is a highly recommended form of physical activity because of its many health benefits. Walking can help us control our weight, increase our energy levels and good cholesterol, and decrease our risk for hypertension, cardiovascular disease, diabetes and stroke. Some research suggests that light aerobic exercise prolongs mouth-to-cecum (first part of the large intestine) transit time; some studies suggest that gastric emptying (time it takes for food to leave the stomach) doesn’t change with exercise; and some research suggests that transit time is accelerated with activity. The components and quantity of the meal and the type and intensity of the activity certainly could be factors as well. There isn’t anything wrong with walking after eating; my wife and I often walk after dinner, and that certainly is healthier than sitting and watching television, which many people do after the evening meal. However, we don’t walk in the evenings because we think it will help digest our food or result in fewer calories being absorbed; we simply walk because we enjoy it! Some people can experience gastrointestinal distress if they walk right after eating, so you may want to wait 20 or 30 minutes before sliding into your walking shoes and hitting the streets or the nearest walking trail. Robertson, G., Meshkinpour, H., Vandenberg, K., James, K., Cohen, A., and Wilson, E. Effects of exercise on total and segmental colon transit. Journal of Clinical Gastroenterology (1993), Vol 16, pp. 300-303. True or False: Wearing the proper running shoe for your foot type helps decrease injury rates? 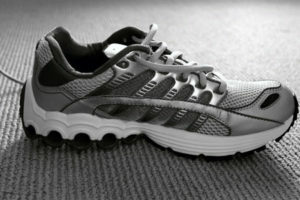 We often hear that wearing certain types of running shoes to accommodate certain foot structures will reduce injuries. I fully bought into this idea about 12 years ago when I started training for my first marathon. I visited a shoe store, and after a quick evaluation by the salesperson, I was told that I appeared to be an over-pronator, meaning that my foot rolled inward as I ran. To counteract it, the seller said, I should buy a motion-control shoe. Keep in mind that prior to visiting this store, I had never had a foot assessment or running evaluation, and I had never spent more than $50 on a pair of running shoes. The salesperson fully convinced me that I needed to spend $130 for a pair of specialized running shoes based on my foot type, so my wife and I sacrificed groceries for a week and a half and bought the shoes. After five or six weeks of nothing but trouble running in the shoes, I retired them and went back to my $50 shoes, kept training and successfully completed the marathon. Running shoes are big business in the United States, and the sale of running shoes is increasing. In 1988 there were roughly 25 million pairs of run- ning shoes sold, a number that increased to approximately 40 million pairs in 2009. I find it interesting that even though sales of specialized running shoes continues to increase, we still have about the same number of running injuries we’ve always had. It can be a bit complicated trying to figure out what type of shoe is right for you. Running shoes are usually categorized as either being stability, motion-controlled or cushioned shoes. Foot variations can complicate things as well. Maybe you’ve been told you have high arches or you’re flat-footed, an over-pronator or supinator, or that you have rearfoot varus or forefoot valgus. Yikes! My searching reveals that there hasn’t been a tremendous amount of research examining whether certain types of shoes can help reduce injury rates in people with certain foot types. One of the published studies on this topic was conducted by Knapik and colleagues (2010) and appeared in The American Journal of Sports Medicine. I’m certainly not a shoe expert, but when I buy shoes I consider the width of my foot (tight shoes hurt my feet), the weight of a shoe (I usually go for lighter shoes), and the most important factor: overall comfort. Taking five or six laps around the store in the new shoes is a good test to be sure they’re comfortable. Knapik, J., Trone, D., Swedler, D., Vilasenor, A., Bullock, S., Schmied, E., Bockelman, T., Han, P., and Jones, B. Injury reduction effectiveness of assigning running shoes based on plantar shape in Marine Corps Basic Training. The American Journal of Sports Medicine. True or False: Exercising on an empty stomach will burn more fat calories? The idea that exercising on an empty stomach will burn more fat calories has been around for some time. You have maybe heard of the book Body for Life by Bill Phillips. It came out in the late 1990s, and in it, Phillips suggests performing cardiovascular exercise in the morning prior to eating breakfast to allow your body to burn more fat calories. The theory is that if you work out the first thing in the morning before breakfast—or even later in the day after having fasted for 6 or 8 hours—your body will have less glycogen (stored carbohydrates) to burn for fuel. As a result, your body will tap fat stores sooner during the exercise session to maintain energy levels. Theoretically, this would lead to burning more fat calories, and you potentially would lose more weight from your workouts. It is true that during lower-intensity workouts—walking, for example— you burn from fat stores a higher proportion of the calories you require for fuel or energy, as compared with higher-intensity workouts such as running. However, the absolute or overall number of calories you burn during higher-intensity workouts is much greater than when you are doing lower-intensity workouts. That’s why even though the proportion of fat calories burned during high-intensity workouts is lower, you actually burn more fat calories overall during high-intensity workouts. I know this is confusing! Look at it another way: If you work out prior to eating breakfast or after a 6–8 hour fast, it is likely your energy levels will be lower and you will not be able to exercise at higher intensities, if that is your goal. The result could be that you burn fewer calories (even fat calories) during your workout. Most fitness professionals recommend eating 100–200 calories prior to exercising to help you maintain your blood glucose level as well as your energy level during exercise. Research has also clearly shown that if we wait for long periods of time to eat between meals, we often get ravenously hungry and overeat when we do sit down for a meal. Imagine not eating for 6 or 8 hours and then also performing a workout prior to eating something! Safety should be considered as well. Many people get light-headed or dizzy if they try to perform physical activity on an empty stomach, which could lead to fainting and possible injury. I certainly understand the desire to try to tweak our workout routines in an attempt to burn a few more calories or shed a few extra pounds. However, I urge you to always use the common sense test when you hear or read about new workout programs, techniques or suggestions—especially if someone is selling a new and exciting product. 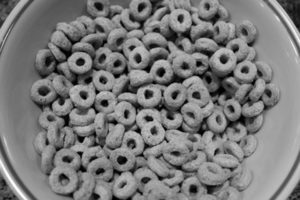 I know many people who tried the don’t- eat-before-working-out-in-the-morning routine. Almost all of them lost a few pounds, but the routine didn’t last. After a few weeks or a few months at most, they were back to their normal habits. Schoenfeld, B. Does cardio after an overnight fast maximize fat loss? Strength and Conditioning Journal (2011), Vol 33, pp. 23-25.